Post-war independent producers could be a scurvy lot, and their freebooting, one-step-ahead-of-the-sheriff exploits often as not evoke images of real-life Larson E. Whipsnades, forever eluding creditors as they manipulated assorted investing suckers. Lester Cowan was one such artful dodger who managed to ensnare diverse one-time major players, anxious to do business again now that the war was over and there were major profits, and tax advantages, to be gained in speculative, do-it-yourself movie dabbling. It was often a game called on account of darkness, at least for the unwary participants who allowed themselves to be lured into what were generally undercapitalized, if not downright shady, producing ventures. Shutdowns were frequent, bank repossession of negatives was not uncommon, and lawsuits often dogged these projects for years after release. Mary Pickford was experienced enough to know better, but idle afternoons in the estate she'd once shared with Doug were beginning to weigh heavily upon the silent star, and Mary was ready to play at movies again. So were The Marx Brothers, but for differing reasons of their own. The result of this ill-fated collaboration was Love Happy, and it would be the Marx’s final act as a team in features. 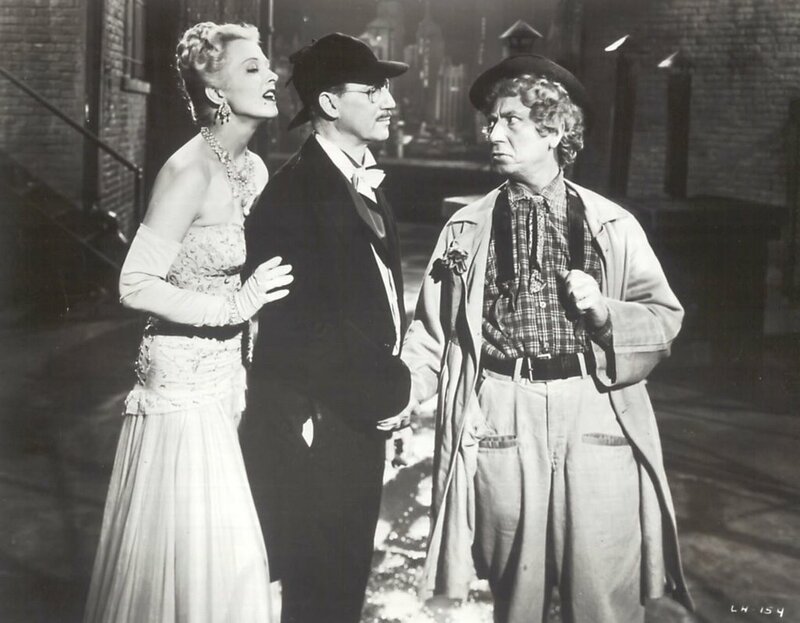 Groucho and Harpo would largely banish the film from their memoirs, if not memories, and even the hardest core Marx fans would find little worth defending in this slapdash mess of a show. It started out as a Harpo vehicle written by his friend, Ben Hecht. Groucho always said Harpo had a Chaplin thing going, much as Jerry Lewis would later, and Hecht’s treatment seems to have accommodated the sort of tears of a clown stuff that a now sixty Harpo was angling for. Trouble was, none of the studios wanted in on the rebirth of a post-Capra Harry Langdon, which seems to have been the model for Hecht’s overall concept. The writer saw Harpo as an ageless sprite, an imp of nature, the eternal Puck, and where’s the exit, folks? --- cause this was plainly a Harpo nobody but Harpo (and Ben) wanted. Somewhere along development lines, a debt-ridden Chico hopped the freight, and suddenly it looked as though a real Marx Brothers reunion might be in the offing. Financing carrots were dangled, but only if Groucho could somehow be induced to sign on. He was, and did. Mary Pickford’s participation was assurance of a United Artists distribution deal, and with all three brothers on board, Lester Cowan (who’d had a previous independent hit with The Story Of G.I. Joe) was able to finagle the balance of his start-up money. 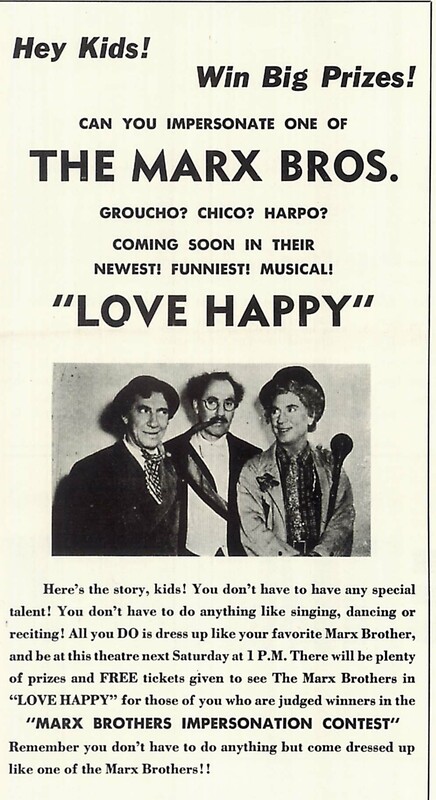 Initial dealings called for Harpo, Chico, and Ben Hecht to own fifty percent of Love Happy. To no one’s surprise, the money ran out before filming wrapped and a desperate Cowan resorted to a product placement scheme commonplace in today’s synergized industry, but largely unexplored in 40’s Hollywood. The idea was to run Harpo over a series of rooftops for a chase sequence that would cap the movie, and provide comedic backdrop for generous audience views of sponsor billboards. 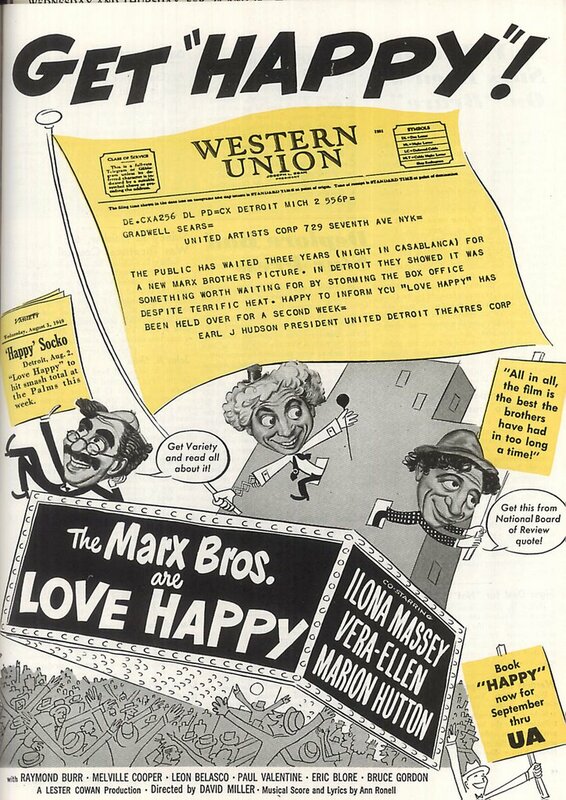 As the villains pursued Harpo, he would utilize oversized advertisements as props for visual gags, and each manufacturer would pay Cowan for the privilege of having their merchandise featured in a Marx Brothers movie. Mutual back scratching would continue upon release as Love Happy received prominent mention in print ads for participating companies. As far as exhibitors were concerned, the whole thing smacked of payola --- only they weren’t in on the gravy --- so United Artists wound up getting the air from a lot of disgruntled showmen after trade mags spread the word, leaving Love Happy to gather dust in UA exchanges. Domestic rentals for Love Happy were just over a million, which couldn’t have been good news for the burgeoning list of claimants against Artists Alliance, Inc., Lester Cowan’s production company --- even less welcome was an uprising among the billboard sponsors. Cowan had taken $2,000 from the Fisk Tire Company upon his guarantee that Love Happy would garner an audience of fifty million (! 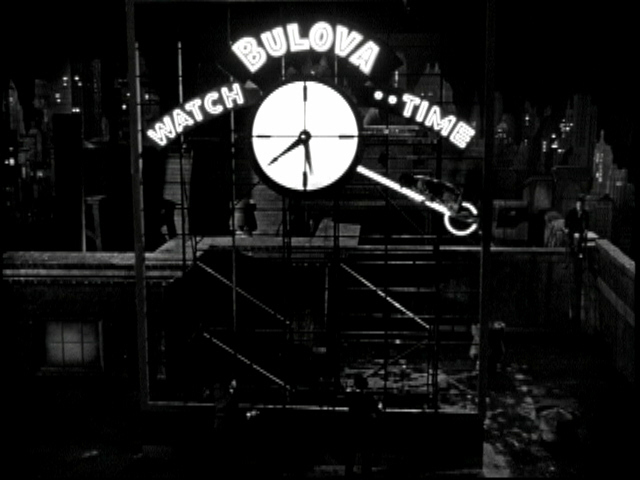 ), and the Gruen Watch people saw red when the wily producer pulled a last minute switcheroo and replaced their agreed upon billboard with one for rival watchmaker Bulova (here’s Harpo swinging from their sign). Seems Lester was piqued because Gruen refused to advance 25G’s for his Love Happy ad campaign. Presiding judges nixed the timepiece merchant’s bid for a court injunction to halt showings of the film (hey, he was probably looking forward to a new Marx Bros. comedy same as the next guy!). Other matters before the bench included Groucho’s suit against Mary Pickford for his appearance fee of $35,000 (well, after all, he only had a few days’ work on the thing). By 1952, there was $765,000 in judgment liens against Love Happy (this according to Scott Eyman's excellent Mary Pickford bio). Even gentle Harpo took up the gauntlet when he walked up to Cowan, "the vilest man in the whole world", and spit in his face. Recovery beyond all this strife was limited to a 1953 re-issue and television sales. That re-issue, shown here with its co-feature, Africa Screams, brought back $106,000 in domestic rentals, much of that attributable to the minute or so appearance by then-newcomer Marilyn Monroe, who was, by 1953, a very big star indeed. Her name and image would be prominent on all of Love Happy’s re-issue art. Here’s the problem with Love Happy. The three Marxes are in it. Just not at the same time. In fact, I don’t think there’s one scene where all three appear together. You’d almost think they were feuding, but we have no published data suggesting trouble on the set. There just seems to be a kind of perverse and ongoing determination on the part of filmmakers to keep them apart. Groucho opens the show from behind a desk (with real mustache and thinning hair --- must have been a surprise for fans at the time). He’s a Philip Marlowish narrator who will re-enter the story from time to time, until the final reel when he belatedly joins the action. By then, it’s too late. We’ve had too much Harpo, too little of Chico with Harpo (they appear to have been quarantined from each other as well), and worst of all, little or nothing of Groucho, who would seem ideally suited to come in and disrupt those dreary musical numbers that make ninety minutes seem an eternity. Grouch’s scene with Marilyn Monroe is justly famed, but she’s on and off within a minute or so --- long enough, it seems, to provide grist for UA publicity mills, as you’ll note here in several MM bally suggestions (and these are from the original 1949 pressbook, not the ’53 reissue). The villainy has a nasty edge. That besieged one-time Sheriff Of Nottingham Melville Cooper takes a needlessly brutal beating from thuggish Raymond Burr as humorless Illona Massey looks on (I’ll be the only modern day scribe who’ll resist the impulse to put Frankenstein Meets The Wolf Man between Illona’s first and last name). Harpo is systematically tortured in a not altogether amusing manner. This might have worked in Duck Soup, but here we’re concerned for the welfare of a clearly aging clown who can only take so much punishment. 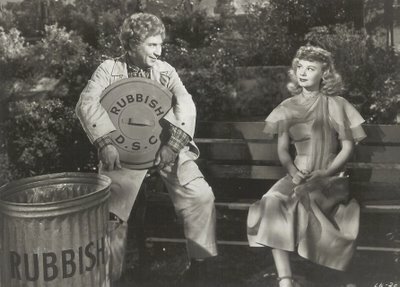 Whatever was left of Ben Hecht’s eternal sprite obsession gets disposed of in an awkward park bench exchange between Harpo and Vera-Ellen. If this is supposed to be an expression of unrequited love on Harpo’s part, maybe he should have solicited Chaplin’s guidance, or least availed himself of a City Lights screening. That big chase among neon billboards is by far the highlight. It’s fun to observe all those neat advertisements, and Harpo does make imaginative use of them. A slender Paul Valentine, our old friend Joe Stephanos from Out Of The Past, has the unlikely romantic lead (he and Marilyn are actually "introduced" in the credits, even though he’d done O.O.T.P. in 1947!). There are Marx fans who will defend Love Happy. I can sympathize with them. It would take a stony heart not to admire troupers giving of their best during what they clearly know to be the twilight of long and distinguished careers. In that sense, Love Happy is essential Marx Brothers. Perhaps it's when those odds are greatest that we can really appreciate what made this team great. Love Happy was not happy for everyone, that's for sure. I am a "completist" when it comes to having their films so I look forward to adding this (and Copacabana) to my collection when they release it to the Shelves. That being said it is not a great film, but it is almost a post script with occasional high spots. 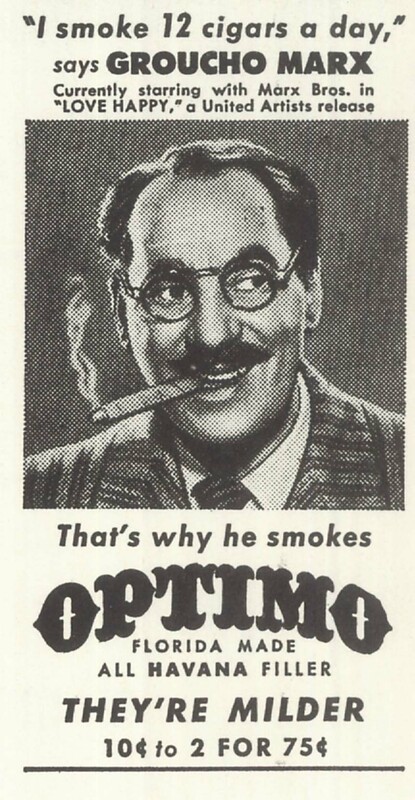 Groucho said that the boys realized in A Night in Casablanca, during the filming of a stunt-laden climatic scene, that they were getting a bit long in the tooth for their trademarked antics, and Groucho himself was ready to draw the curtain. Solo projects were the name of the game for the brothers, and as far as I can gather - they respected each other's projects; Chico's band which toured in the 50s but never made it, Groucho's writing and You Bet Your Life, and Harpo's musical appearances and then we have Love Happy. 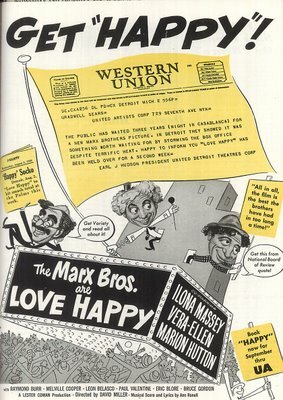 From what I can remember (and I will double check later- so someone correct me if I am wrong) there was no trouble between the brothers on Love Happy, just that the focus had been on Harpo, and the other brothers came on board later in the game for the reasons you mentioned. I believe by the time Groucho came on board to secure financing, the major of the film as originally envisioned had been shot. In order to bring Groucho in (and not reshoot anything, which they couldn't afford) they used him as a "bridging device"- thus Grunion was born. 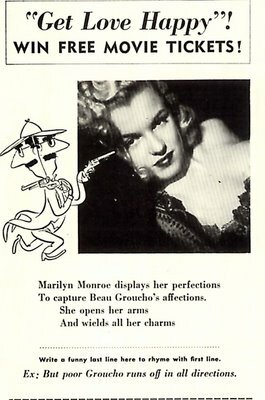 Groucho does discuss Love Happy in some of his writings- particularly, if I remember correctly, Groucho and Me and talks about being involved in casting Marylin. Thanks for a great post! 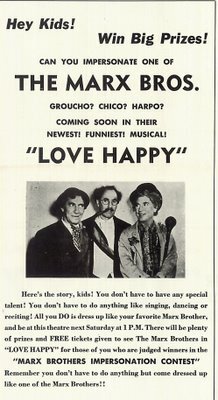 Yet Groucho wrote his daughter, in 1947 or '48, of his plans to shoot "Love Happy" -- as if he and Chico were onboard from the get-go. I think all of them were so disappointed by how it turned out that they wanted to forget it completely. 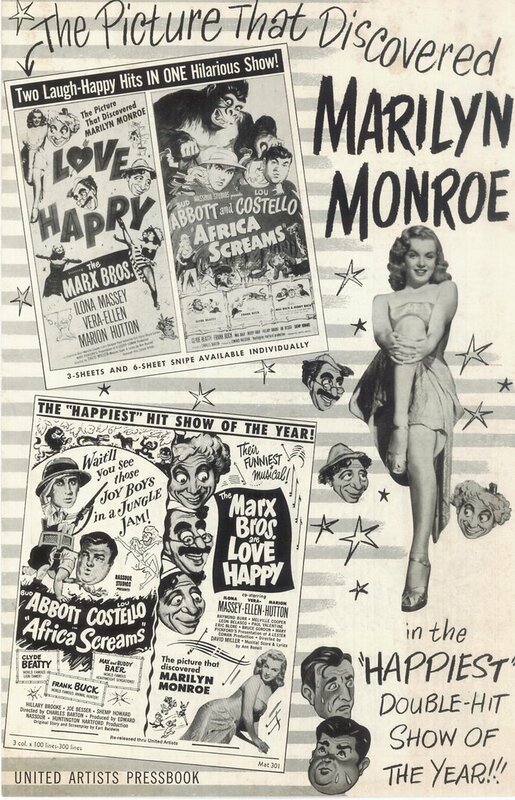 I'd have bet the rent that a film with the Marx brothers and Marilyn Monroe, written by Ben Hecht, would be great. And I'd have been sleeping on the street. The film does come off rather better in a DVD from Republic[Viacom]with sharper picture quality and some bits that were missing from the familiar version.I'd love to find out why those scenes had been cut.